Foreign Secretary William Hague - a prominent member of the 'Friends of Israel' organisation - has issued a statement deploring the loss of life. But that 'evenhandedness' just isn't good enough. All of those killed have been civilians engaged in a humanitarian task; and they have been killed by Israeli troops operating outside the law, piratically, in international waters. We in the Green Party condemn their actions; and, if our government fails to issue a similar condemnation, then we will be left with no alternative but to conclude that this new government is soft on Israel, and is not serious about opposing internationally illegal violence, extra-judicial murder and war. If you are a Liberal Democrat contrast this with the silence of your Leader. Time to join the Green Party if you care about peace and justice. 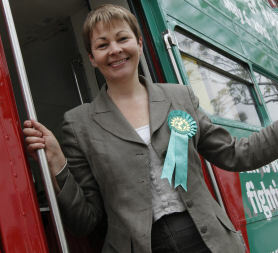 The Green Party Leader, Caroline Lucas MP, has called on the Government to condemn the actions of the Israeli troops in firing on a ship carrying volunteers and medical supplies to Gaza, and to back an urgent inquiry into the incident. In a strongly worded message to Foreign Secretary William Hague, she has demanded that he urgently contact the Israeli authorities to demand an end to the attacks, and that he ensure that Israel is held fully to acount for an illegal and unprovoked attack. "I completely condemn this deadly attack on the humanitarian aid convoy. I am deeply shocked by the brutality of the assault, which has left a still unkown number of people dead and wounded. My thoughts are with the victims and their families. "This attack is a serious infringement of the principles of international law. The Green Party calls on the UK Government, and the EU, to apply pressure to lift the ongoing blockade of Gaza, which makes essential humanitarian aid for the population of Gaza virtually impossible to deliver. We also call for the quick establishment of an international inquiry to shed light on the circumstances of this attack." Ashdown (back before I left their Party ;-). The Miliband brothers both claim to be ‘green-leaning’ candidates, and this is part of what helps them to appear modern and progressive. But the reality, given their actions when leading various government departments, is that their rhetoric masks a lot of inaction. 1. That effort is being successfully conducted if emissions are going down. But most people don’t realise that our Co2 emissions are still going up. A key reason is that the Milibands, David and DEFRA and Ed at DECC, have repeatedly suggested that Britain’s CO2 emissions are going down. 2. David Miliband has often claimed that the UK has achieved major cuts in greenhouse gases since 1990. He sometimes says Britain is on course to achieve 25% reductions in CO2 emissions by 2012. But the figures that Miliband and his successors at DEFRA/DECC (including most notably Ed) are using leave out embodied energy, the inclusion of which would make it very clear that this cannot be so. Even on the most generous figures available to govt (not only excluding embodied energy but also international transport), CO2 has more or less flatlined since 1997, rising in recent years, and thus showing an overall small rise. It is only slightly (a few percentage points) below 1990 (Kyoto baseline) levels. When those factors are included, then there has been little or no reduction even since 1990, and a significant increase since 1997. 3. There has been and remains a further systematic under-estimation of Britain’s contribution to CO2 emissions from air travel, because only aircraft taking off from Britain are counted. That sounds reasonable, until one notices that almost 70% of the passengers taking off and landing in Britain are Britons. DEFRA/DECC ought to be attributing 70% – not 50% – of the emissions of planes taking off from and landing in Britain to the UK. Between 1990 and 2003, estimated CO2 emissions from aviation rose by 90%, a staggering increase. 4. Furthermore, the government statistics do not take into account most of the effects of ‘radiative forcing’ – the increased global heating effect of emissions at high altitude, with the cocktail of gases and water vapour that planes emit. To be fair to the Milibands, they both pushed for transport to be included in Copenhagen and in the EU ETS. But this doesn’t excuse their not having acknowledged the realities bullet-pointed above, which were repeatedly pointed out to the Milibands during their time in office, by Monbiot, by myself, and by others. If the Milibands wish to be seen as ‘green-leaning’ Labour-leadership candidates, then surely they ought to repair their rhetoric on emissions, and concede that the reality is that the Labour government did not reduce climate-dangerous emissions, but in fact saw them increase. And that the party needs to do a lot more to deal with the problem of man-made climate change. The Green Party position on Europe is not remotely 'Euro-sceptical'. We are an internationalist and pro-European Party. The European Green Party is the closest thing that there is to a genuine pan-European political Party (a new 'International', one might say): the Green MEPs vote together much more often that other groups in the Euro-Parl. Last Saturday, I was in London, taking part in a big demonstration in Trafalgar Square in favour of changing on antiquated voting system in this country. Alongside Libdems, Greens, one or two Conservatives and UKIP-ites, and many people belong to no political party, I marched with Billy Bragg to where the Conservatives and LibDems were talking about a possible coalition. We chanted "No deal without PR [proportional representation]", until eventually Nick Clegg felt obliged to come out and address us. I stood a few yards away from him, as he spoke with us and (sometimes) we chanted back friendlily to him. It felt like democracy alive. Now, a week later (how long a week can be in politics! ), Nick Clegg is actually Deputy Prime Minister, in a coalition with the Conservatives. And all the intervening worries about how we might end up with 'an unelected Prime Minister' (if we had ended up with Brown's successor as Labour Leader, as Prime Minister) seem like ancient history. But they are not. For the new coalition government, whatever its faults (and I suspect that they will be many), is promising some interesting political reforms. We may end up with a changed electoral system (not, sadly, PR, but at least AV, the 'Alternative Vote' system, in which you rank the candidates in order of your preference, and therefore no candidate can be elected without a majority of votes). We may end up with an elected second chamber. And we will probably end up with fixed-term-Parliaments. Now, if we have fixed-term Parliaments, and if those Parliaments are hung (as they often will be, especially under AV voting), this makes it inevitable that there will sometimes be 'unelected Prime Ministers'. For, if power changes hands during a fixed-term Parliament – if there is a rupture that forces a change in what the governing coalition is - then the Prime Minister will by definition be changing without a new election. We are not talking about a Prime Minister from the House of Lords. We are talking about a Prime Minister who has been elected just like any other MP, to our House of Commons. We have a Parliamentary system, not a Presidential system (the misleading format of the TV debates notwithstanding). MPs choose who the Prime Minister is, the people don't choose the PM directly. We saw this in action a few days ago, when it was the balance of preferences among the MPs that ultimately determined that it was Cameron who would end up in number 10. Commentators have often pointed out recently that it is exactly 70 years since Churchill's coalition government was formed. But they omit to mention that Churchill too was an 'unelected Prime Minister'. He succeeded to power after Chamberlain resigned, without any intervening General Election. If being an 'unelected PM' was good enough for the man who is by popular acclaim the 'greatest Briton ever' (though actually Churchill wasn't great in how he behaved toward the miners, Gandhi, etc. – but that's a story for another occasion), then it should be good enough for us now. As I say, if we have fixed-term Parliaments (which would end the ludicrous uncertainty about when General Elections are going to be), then we will get used to it being thus. And why shouldn't we; for there just is no decisive argument, at the end of the day, in our political system, against having a so-called 'unelected Prime Minister'. Its welcome news that the new government is abandoning plans for a 3rd runway at Heathrow. But the fundamental issue is unaddressed. The neoliberals gathered around the Cabinet table (They're neoliberals to a man - even Huhne is basically a downtheline Orange-Booker) want nothing more than to restart economic growth. (Of course, their mad rush to cut cut cut may create a recession or even a (disastrous) Depression for a while, rather than, as Greens wish to do, stabilising the economy; but sooner or later, they will probably succeed in starting up the conveyor belt of 'economic growth' once more.) Their economic desires run exactly counter to their environmental desires. Senior figures in the Green Party in the East of England are saying today that the LibDems have betrayed the people who voted for them at last week's General Election with the deal they have struck with the Conservatives for a new coalition Government. Adrian Ramsay (Green Party Deputy Leader nationally, and also a Councillor in Norwich) commented: "There are real risks to cutting back on public spending while the economy is still recovering from recession - which is presumably why the LibDems didn't support making cut backs this year in their manifesto. I'm very concerned that the LibDems have now signed up to the Conservative cuts and about what this may mean for crucial local services such as Sure Start nurseries and day care centres. "The Green Party's General Election manifesto showed that there are ways of dealing with the deficit whilst protecting public services." C'llr. Rupert Read (who narrowly missed election as this Region's first Green MEP, a year ago) added: "The way forward should have been through green investment to stabilise the economy, not through public service cuts. So the people of Eastern England can trust that we in the Green Party will fight these Tory-LibDem cuts, tooth and nail." C'llr. Read continued: "I fear that the new alliance between the Conservatives and LibDems will take us in the wrong direction. I don't think these cuts are what people in the East voted for last week. Many voters who voted LibDem last week have already told us that they are now regretting having done so, and will instead look to the Greens next time." C'llr Ramsay concluded: "Nick Clegg has also failed to use this situation to secure a fair voting system where every vote counts equally. LibDems have been campaigning for this for decades and this was their chance to make it happen. I think many LibDem activists and voters will be feeling betrayed." 1. There is going to be a referendum on the Alternative Vote, but that is not a proportional voting system nor is it LibDem policy. So: At a time of unprecedented market failure (financial, environmental), we have a government of deregulators. At a time when the state has saved the day (for now) financially, and is a key part of our only hope environmentally, we have a government of 'savage' cutters. At a time when we supposedly live in a classless societies, we have a government of toffs who believe that they were 'born to rule' (http://www.telegraph.co.uk/news/election-2010/7664461/David-Cameron-born-to-be-prime-minister.html ). And at a time when proportional representation was at last within reach, all we are going to be offered is the dismal half-way house of AV. Millions voted to keep the Tories out - and the LibDems have voted them in. Voters won't forget that betrayal. And Labour let this happen, shamefully, by abandoning the chance of a 'progressive alliance'. They could have stopped the Tories, as I've been arguing on this blog these past several days - they have CHOSEN not to. Shame on them. ...Anyway: It's going to be a long long haul. The fightback begins here. I'm proud to be a Green tonight; and ashamed of the failed political system we live in, and of the useless politicians who are swapping from the Government to the Opposition benches and vice versa. Who are leading us to economic and environmental disaster. Yes, I'm not a happy bunny tonight. And the most probable future for our country and our world is, I fear, grim. The only consolation is that all three Parties have disgraced themselves (apart from the Tories, who were a disgrace already), and so there may be good times ahead for genuinely oppositional voices, who have got it right, such as the Green Party. Unlike the others, we didn't lose Thursday's election - we broke through, for the first time. And we are going to be needed more than ever. The awful threat looming if we do not get a #progressivemajority government is that of a snap election in which Tory cash - and #Cashcroft in particular - will overwhelm us all, all the Parties of the green/left/centre. For: we'll be bust, unlike the Party of the rich. If there is to be a 'rainbow alliance' of some kind, then it needs to get some positive response from Labour SOON. Why are Labour being so hostile about the smaller Parties at present? (http://bit.ly/96lrX6 ) They need to get over that, and fast. The government will (quite rightly) have no security not to be voted out if it has made no effort whatsoever to respond to the concerns of the SNP (http://news.bbc.co.uk/today/hi/today/newsid_8674000/8674198.stm ), Plaid, Greens, etc. As Riddell pointed out on Today this morning, you have to have some kind of Agreement (I think Riddell over-estimates how difficult it would be; he fails to take into account the strong anti-Tory sentiment that would bind the Parties together): http://news.bbc.co.uk/today/hi/today/newsid_8674000/8674182.stm . A minority government is sooner or later bound to fall. A Co-operation Agreement, by contrast, could work - as it has done in Scotland, these past 3 years. "I think we would rule out a formal coalition, but we're very interested in talking about ways we might co-operate." And on her victory in Brighton Pavillion: "It's only one seat - but it's the first seat. It was only 24 years between the first Labour MP and the first Labour government." These quotes are from a New Statesman piece (which spins the first one very misleadingly), to appear soon. One terrible danger of a Tory government is a snap election this autumn (in which the Tories' big cash-bank - and Cashcroft himself - would swamp the rest of us, who are all out of cash after this election-campaign). A rainbow progressive-majority government could prevent this hazard. This is a key reason for Labour, the LibDems, the Nats and the Greens to welcome the idea. Furthermore, if the LibDems go in with the Tories, they will have to get a form of PR which is kind to small Parties - because they may well BE a small Party, after propping up the Tories... But the Tories will not yield up genuine PR that is kind to small Parties (such as AMS, or AV-Plus with a decent top-up or STV with reasonably large constituencies). But a rainbow coalition would. Because Cameron HAS failed drastically to get his Party what he promised: a majority, if they went down his semi-Blairite road. They have squandered an election-winning lead in the polls, despite an epochal economic and political crisis. Their campaign was utterly inept, in so many ways, as people have pointed out in so many ways in so many places (e.g. their posters had ALL the wrong messages - "I'll cut [the NHS]" "I've never voted Tory", etc etc). And Cameron was awful in the debates - he lost the first and third to Brown and the second to Clegg, and this is only not seen because of the right-wing press in this country, which were desperate to try to deliver a majority for him, and are now understandably disappointed that he still managed to screw it up. SO: It is unsurprising that the Tory true-believers are wondering why they squandered their homophobia and their climate-denial and their class warfare etc. just so that they could end up kissing up to Clegg. I believe that, now that we have broken the Westminster barrier, anything is possible for the Green Party. It all depends on how people now react, what people now choose to do and to hope for. If enough people start joining us, then we could be a phenomenon in the 21st century to start to rival Labour and its huge growth in the 20th. It is _not_ wishful thinking, but hope-full thinking, that can spread and grow, and that might yet save our endangered civilisation, to remark that there is now suddenly a huge potentially-self-fulfilling political phenomenon beginning. That's the remarkable thing about human being - that it can make possible things that seem impossible, through individual and collective belief in them. This election, having turned into a classic two-Party squeeze (it came down to whether one hated the Tories or Labour more, as a potential Party of government; earlier in the election campaign, it was a novel phenomenon, a 3-Party-squeeze, which already was very tough for smaller Parties such as the Greens - 'Others' shrank from c.13% to c.6% in the national opinion polls, as a result of Cleggmania), was always going to be very very tough for a Party many of whose voters are thoughtful. People vote for the BNP and UKIP because they are angry and are flailing around for a scapegoat (namely: people of a different skin colour / culture / religion). People vote for the Green Party because they want a better future and have thought about how to try to bring that future into being. This makes Green Party voters far far more inclined to vote tactically. We know for a fact that here in Norwich South many many would-be Green voters voted Libdem or Labour for tactical reasons, especially in middle-class areas where we have typically our strongest 'core' support. This effect was present tenfold or a hundredfold stronger in virtually every other seat in the country that we contested. This explains the drop in our vote outside Brighton Pavillion, Norwich South, Cambridge and a handful of other places. [ If you want to know more specifically what happened in NorwichSouth, check out my earlier post: http://rupertsread.blogspot.com/2010/05/so-what-happened-in-norwichsouth.html ] Green voters are very likely to vote for other Parties, under FPTP. BNP and UKIP voters, far less so - _they_ are just expressing their anger and frustration, and venting it on an easy target. So, there is no need to worry (as some are doing at this time, with electoral reform in the air, but widespread concern that we may not get real PR) that Greens would do badly under AV. AV is not a proportional system, but it would allow people who want to vote Green to give us their first preference. In many many places, these first preferences would very soon start stacking up enormously - because AV allows people to vote for what they believe in (and so goes quite a long way in itself to solving the 'co-ordination problem'). In Norwich South, huge numbers of people want to vote Green; and some do, already. The Party which should fear AV is the LibDems. For how many people have LibDem as their first preference? Hardly any. The LibDems are purely the 'We're not Labour and we're not the Tories' Party. The LibDems could do well under AV if they get more first preferences than (one of) Labour or Tory, and so survive to clean up on their 2nd prefs. But in how many constituencies would that happen? Very few, is my educated guess. Now that Caroline has been elected, we will grow, and grow at Westminster. Here of course is another absolutely huge difference between BNP and Green elected politicians  where Greens get elected, we usually stay elected, and often grow and grow. When people get Greens, they like what they get, and want more of us. When the BNP get elected, they are out on their ear within a few years' time (as in Barking and Dagenham, and several other places too, this time). Without PR, the next General Election will be tough for us. Norwich South is our only obvious strong prospect for a gain, next time around. But going from 1 to 2 wouldn't be bad; and we could get set up at the same time for a big tranche of gains at the following G.E. (See http://rupertsread.blogspot.com/2010/05/tactical-voting-strategic-voting.html ). With AV, the sky's the limit. And the same with any genuine form of (real) proportional representation. The Euro elections give a reasonable indication of our potential at a PR election. We would make any likely threshold in a national system. We would beat the BNP, and probably beat UKIP too (obviously, the Euro-elections over-estimate UKIP's general level of support, because in the Euro elections people's minds are focussed on the EU specifically). An openletter to theLibDems: Proportional Representation now! I know that you will be very busy right now. Indeed, it is because of the cause of that busy-ness that I am writing today. I'm writing to ask that you use your influence to try to help ensure that this once-in-a-lifetime opportunity for real electoral reform is not lost. From my teenage years, as part of the Fair Votes campaign and petition, through all my years in the LibDems, and (then) in the Green Party, I, like you, have been a consistent and passionate advocate of PR surrounded by other such advocates. Whether you make a deal with the Tories, or (as I would hope and prefer) a 'progressive majority' deal with Labour and the other Parties of the centre-Left at Westminster (including the Greens), I would urge you to insist upon proportional representation - on AMS, STV, or a proportional form of AV-plus - as part of that deal. The number of votes that it took to elect a LibDem at this election (letalone the number it took to elect the first Green MP) is entirely and quite grotesquely disproportionate to the number needed to elect a Labour or Tory MP. So, now is not the time to ease off what we have collectively been insisting upon for so long. Britain's political system is broken - PR is part of what is needed to heal it. Crises are there for a reason - so that real change can be made, to heal what is in crisis, what is broken. It's been a bizarre and confusing election that defied all predictions. But what does it mean for the our politics and democracy? OK will be publishing reactions to the result from party campaigners. Here Rupert Read welcomes the Greens' first MP. 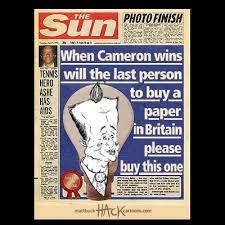 It seems an age ago now that Murdoch played his hand, having decided in which direction he felt the prevailing wind was blowing, and declared that the Sun would be backing the Tories in the General Election. The Australian with the American citizenship doesn't like to be on the losing side in a <?xml:namespace prefix = st1 ns = "urn:schemas-microsoft-com:office:smarttags" />UK election, see. He likes to think he holds sway over the British electorate. No doubt he's in his office right now trying to figure out how he can spin 'IT WAS THE SUN WOT HUNG IT'. Pull the other one mate. You're quite possibly 'done' in this country. The one result that really screws you is being shouted from the roof-tops; the two-party system that has worked so well for you is now consigned to history. No more Thatchers, no more Blairs... not in Britain's balanced-Parliament / electorally reformed future. Perhaps even the following is true: IT WAS THE SUN WOT HUNG IT(SELF). Priceless. So, what happened in Norwich South? I confess, I was gobsmacked by the result. I didn't expect that we would win - but I didn't expect that the LibDems would win, either. How come the LibDems won in Norwich South, while they gained hardly anywhere else, and had a shockingly bad night overall, losing seats in total, contrary to everyone's expectations? I knew that we were losing some votes in our 'heartlands' to the LibDems, due to people voting 'tactically'; but I thought that we were more than making up for those with votes that we were winning off Labour, in its heartlands. And we did. I was right about that. And there was the clue. In retrospect, I should have seen it coming. Basically, Labour lost thousands of votes to the Greens, on the Council estates etc. of Norwich - and the LibDems were therefore victorious, without having to do anything except hold more or less steady. So there we have it. Irony of ironies; a huge advance for the Greens; no advance for the LibDems; and yet they take the seat off Charles Clarke. This is why the LibDems won in Norwich South, whereas they didn't win in much stronger targets of theirs around the country, such as for instance Oxford East, to name but one. The Norwich LibDems are fortunate to have lucked out, benefitting from, not a LibDem surge (there was none) but a Green surge. Tactical voting isn't really good enough. What's needed now is STRATEGIC voting. And the centre-piece of the strategy surely has to be: build a climate-friendly polity, a more egalitarian society, over the medium- and long-term, by boosting the only Party that is really serious on ecology and on social justice: the Greens. Voting Green in Norwich South is voting with your heart - for what you believe in, for what will _really_ make a difference - AND voting with your head - for the Party on the rise, rather than (in the case of the LibDems) crashing and burning. Did you know that the LibDems in Norwich have gone from having 30 City Council seats to just 6? Looking at the posters around the city makes it clear that the Greens are the Party on the up here. Seen the bit at the bottom, here? This is really shocking. Tingle scored UKIP's highest ever vote for Westminster, last year. This is the kind of person that one is voting for, if one votes UKIP. This is the kind of person their MEPs are, and the kind of person their MPs would be if (God forbid) they were ever to get any elected. Virtually everything he says is either a disgrace or factually-false. He's condemned by his own words as a climate-denying, xenophobic, anti-poor, war-mongering, scare-mongering bigot (Yes, the word this time is well-deserved). Jess Goldfinch, my successor as the Green Party candidate in Norwich North, comes out of the survey very very well by comparison, obviously! Having written these things, frankly, Tingle should stand down. There is no place in a civilised society for such a candidate for public office. Notice that his remark about Afghanistan was so bad that they do not even want to quote it in the media. But you can see it on 'enemies of reason', above. It's good that Tingle has apologised. But I don't see how there can be any excuse for these kinds of remarks. Other candidates for other Parties have stood down during this election campaign, for lesser crimes. Tingle should go, over this. I don't think there was ever a question of whether or not I would start blogging...I was just waiting for the blogosphere to be invented! I've been passionate about politics my whole life and I see blogging as another vital way to reach people and to spread and (in the process) improve my Green philosophy. The blogosphere (at its best) encourages and nurtures intelligent debate, the exchange of views that is necessary if we are to acknowledge (never mind address) the enormous ecological and social challenges we face. I like blogging best when it results in a wiki-like process of EVERYONE, including the original author, learning from it. Green minded-news, comment, insight and discussion on the political scene and the media in <?xml:namespace prefix = st1 ns = "urn:schemas-microsoft-com:office:smarttags" />Norwich, Norfolk, Eastern England, Westminster, Brussels and beyond...and when commentors are being civil it is often a hot-bed of lively debate! What do you like best about your own blog? Greens are a little voice in a big blogosphere. What motivates you to carry on and how do you see the Green blogosphere developing? Although there are fewer of us out there (at the moment!) than there are Tory or Labour bloggers, I think we are making a big enough noise to worry the traditional political groups! I'd like to think that the Green blogosphere will develop globally but function locally, with a huge network of people sharing ideas and working together on projects that promote sustainable living conditions on the ground while always being ready to fight the self-serving interests of big oil and big finance. The Greens are the only truly progressive Party out there and hopefully, with a couple of victories on 6th May, a hung parliament and the ensuing electoral reform, we can take advantage of the huge level of support there has always been for the Greens amongst the country's youth and become one of the major political forces in the UK within the next ten years. That's what keeps me motivated...and I imagine it's something that scares the cr*p out of the LibDems, because a lot of our support will come from their base! That's very much what we've found in Norwich. So I think, with the likely end of the Labour government, this could be a very fruitful time for genuinely oppositional voices, such as (crucially) ours. What are the key Green issues that you wish Lab/Con/LibDem would damn well take notice of? In a country with almost zero manufacturing industry, a burgeoning carbon footprint and fast-dwindling supplies of fossil fuels, I would have thought that wholesale investment in low/zero-carbon technologies would be a no-brainer for any political party. The Green New Deal is essential  and the beauty of it in economic terms is that it pays for itself, over time. Because wasting energy (and emitting excess carbon) means wasting money too. And such waste would be finally put into reverse, if a Green New Deal were brought in. The other key Green issue for me right now is equality. Everyone needs to read Wilkinson and Pickett's THE SPIRIT LEVEL. Green policies are strongly oriented toward creating a more equal society, and such a society benefits everyone, including the rich. There is sometimes the perception that Greens are a bit anti-technology; how does digital media fit with the Green philosophy? Greens love digital media for many reasons, including that it allows bottom-up mobilisation, and that it can reduce quite drastically the need to travel (Remember that transport emissions are the fastest-growing climate-dangerous emissions.). More attention however needs to be paid to the massive problem of computer-waste (a problem particularly severe because of the tinyness of many components of computers, making them hard to re-use or recycle) and to the growing energy consumption of 'server-banks'. If you could change one thing about politics (generally) what would it be? We need democracy  rule by the demos, the people. We don't have it at the moment. The place to start therefore is with electoral reform...STV or AMS. PR, and an elected second chamber (or one picked by lottery) and legislation to ensure that any politician caught lining their pockets (e.g. like a number of the greasy bastards were last year) ends up doing six months staring at the top bunk waiting for 30 minutes exercise time. In the long run, true deep democracy will require localisation, which we stand for (as opposed to globalisation, which all the other Parties support). Best news story of the last year and why? Copenhagen was pretty disastrous; but some really great news that came from it was the emergence of the small island nations and of the left-leaning Latin-American nations as brave bastions of climate-action, setting out clearly and starkly what needs to be done to save the future. My belief is that the green movement now needs to unite behind these countries, and to press our own governments to do what they are saying. So, one specific good news story soon after Copenhagen was Evo Morales's re-election. In the UK it would have to be Caroline Lucas. She has been instrumental in professionalising the Green Party (a task in which I have assisted), has done great things in locally Brighton Pavilion and nationally across the media and many many public meetings etc., and her Parliamentary work in Brussels has been exemplary. Least favourite politician and why? It's Nick Griffin. Do I really need to explain why? Least favourite blogger and why? I don't know if he is my favourite blogger, and of course I disagree with him periodically, especially over the day-to-day practical realities of politics on the ground (the danger for some bloggers is that they don't fully understand how electoral battles are actually won and lost on the ground, through money, leaflets, staffers, etc. ), but I think that Sunny Hundal is an important blogger (and twitterer) who I always find stimulating to read. My old debating-sparring-partner from Oxford, Michael Gove, said an hour ago on TODAY that local authorities need new powers in order to be able to act firmly on licensing matters, so that local people can get pubs regulated or closed down if they (the pubs) are too noisy, etc. . This is not true. The powers that the licensing act passed by this government has given us in local authorities in order for us to be able to do this are very extensive; and they have already been used on several occasions in Norfolk. It appears that Michael has not been able to come up with a good example of how his 'big society' would actually make a difference. 1. 2. 3. Rupert's Read: May 2010 4. 12. 15. 18. 19.